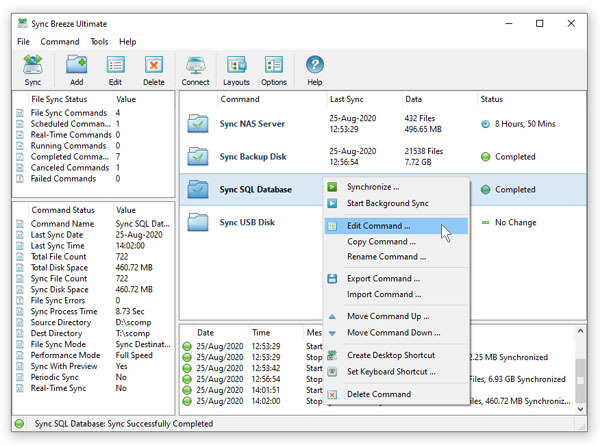 For users frequently synchronizing numerous directories, network shares and/or NAS storage devices, SyncBreeze provides the ability to pre-define multiple, customized file synchronization commands and easily execute them is a single mouse click. In order to add a new, pre-defined file synchronization command press the 'Add' button on the main toolbar and specify a unique command name. On the file synchronization command dialog enter the source and destination directories, select an appropriate file synchronization mode and press the 'Save' button. Now, the newly created file synchronization command may be easily executed at any time just by clicking on the command item in the commands view. For each file synchronization command, SyncBreeze shows the command name, the last synchronization time, the total number of files and the amount of data in the source and destination directories and the status trend showing how the amount of data is changing over time. In order to edit a file synchronization command, select the command item in the commands view, press the right mouse button and select the 'Edit Command' menu item. Select one or more file synchronization commands, press the right mouse button and select the 'Delete Commands' menu item to delete all the selected file synchronization commands. All the user-defined file synchronization commands are stored in the user-specific product configuration file, which may be exported for backup purposes and later used to restore the product configuration on the same or another computer. In order to export the user-specific product configuration to a file, select the menu 'File - Export Configuration' and specify a file name to export the product configuration to. Select the menu 'File - Import Configuration' to import a previously exported product configuration file.